If he ever disappears on you, go immediately to the nearest computer, cell phone, mp3 player or video gaming console. I promise you’ll find him. Like most kids these days, he’s far better at all things technology related than I am. I have a feeling he’ll be begging to take apart my computer to make it more efficient by the time he’s 5. 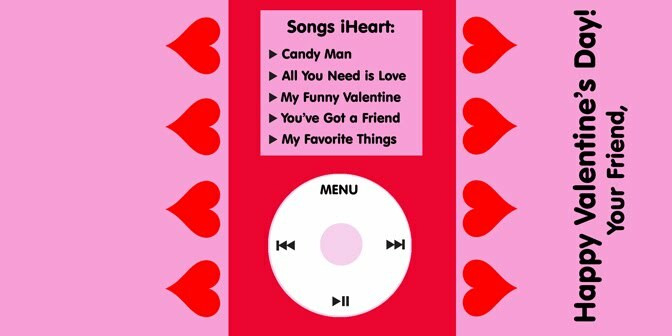 So, with Valentine’s Day just around the corner, I decided to create some treats for his classmates incorporating the things that he loves most – music and gadgets! I remember seeing this idea in a magazine several years ago (I think it might have been Family Fun Magazine? ), and I decided that these would be perfect for Sutton to hand out this year. 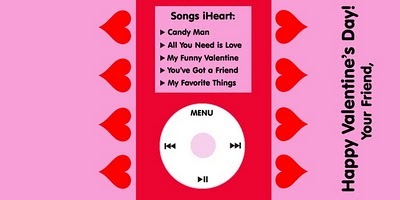 I wrapped boxes of conversation hearts in cute wrappers that I designed, and I created “headphones” with mini peanut butter cups and some plastic lacing. I decided that you’re all smart enough not to need a step-by-step tutorial for this one, so just remember to tape your headphone laces to the candy box before you wrap it up, okay? ADORABLE, easy peasy and totally Sutton inspired! If you want to make some of your own, you can download the printable wrapper here – ENJOY! I remember seeing this in Family Fun too — so cute!